Some people have a hard time deciding what they really want. ...it’s hard to zero in on things that are most important. Choosing a credit card is no different. Rewards, insurance, cash back, perks, low interest, good reviews ...they ALL sound good, right? Right! If you're trying to work out which credit card is the best for you, you’ve come to the right place. Not only have we taken all the cards in our database and calculated their rewards at the max possible earnings, but we have also considered things like insurance, perks, interest and anything else that makes a card stand out (for better or worse). Then we compiled a list of the 10 best Canadian credit cards overall. So, how’d we do it? We review a total of 50+ features of each credit card we track. After we crunch some numbers, we show you the annual rewards in real dollars and calculate our Genius Rating out of 5. And what’s more? Our top 10 list has nothing to do with affiliate relationships or personal preference. Our algorithm is strictly independent and completely math-based, so you can know that we stand behind our picks. We do believe that the cards on our list are the best cards in Canada right now. 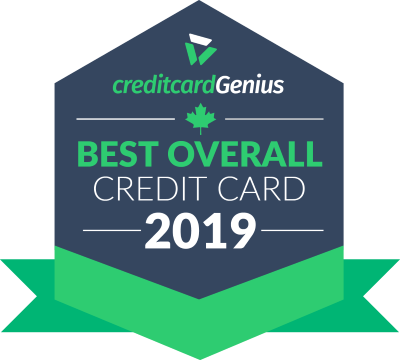 The best overall credit card in Canada for the second year in a row is the . How did it win all of these awards? By earning plenty of points that have great value. As a welcome bonus, you'll also earn 2,500 points for every month you spend $500 in the first 12 months. That's up to 30,000 points right there. But more than earning plenty of points, this card offers great value and many ways to use them. The best value is by using the American Express Fixed Points chart to book flights. You can get a value of up to 2 cents each when redeemed this way. When booking any travel from any provider, each point is worth 1 cent each. When using your points for a cash statement credit, each one is worth 0.7 cents. You can even transfer your points to Marriott Bonvoy at a 5:6 ratio. And with an insurance package that features 9 types of purchase and travel protections, you're covered if something happens during your travels. Add it all up, and American Express has a clear winner for best credit card of 2019.